The opening sequence of the dance presented in a traditional manner. Images courtesy of Jacob’s Pillow. Titles projected above explain the narrative. The maiden Banyaki is ordered top transform herself into Sita. Pichet Klunchun who founded the company in 2004. A contrast between traditional and contemporary. The company engaged in lateral movements. As a part of its commitment to world dance Jacob’s Pillow presents the U.S. premiere of Chui Chai by Thailand’s Pichet Klunchun Dance Company this week. Performances continue through Sunday, July 18. 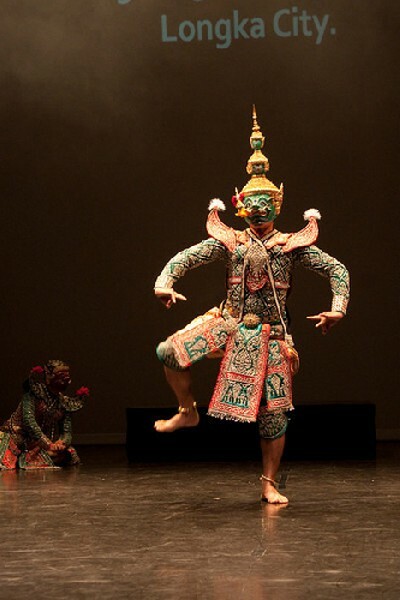 The hour long performance of a single work started in the slowly stylized manner of traditional Thai dance. It offered a highlight of the Nang Loi (Floating Lady) episode from the Ramayan epic. It entails a conflict and war between Thodsakarn and Rama. Thodsakarn ordered his niece Banyaki to transform herself into Sita the wife of Rama. It is a part of the deception to trick Rama into ending the war. This information is conveyed in the program notes. But also spelled out in projections on the back of the stage of the Doris Duke Theatre. There is also a briefly projected image in sepia tones of traditional Thai architecture. It is assumed that the majority of the audience, including this writer, know little about traditional Thai dance. So part of the motive of the titles appears to be facilitating our understanding of the slow, meticulous, and stylized movements. The principal dancers wear masks and all have elaborate head dresses with spiky pinnacles. The exquisite costumes are elaborately beaded. For the western audience there is the immediate impact of cultural differences. The pace accompanied by exotic music is languid. The dance is conveyed primarily through elaborate and expressive movements of the hands. There is none of the full body movement and spectacular athleticism we associate with western dance. It evokes a different sense of time and patience. As well as assumed knowledge of the telling of ancient tales of war, romance, and the intervention of the gods. At about the mid point there is a shift. The company exits and there is a seemingly comic interlude. The projection of titles fast forwards to contemporary society. There is chatter and laughter about just who and what Sita would be were she alive today? Would she perhaps be an exotic dancer or a model? Would she work in a massage parlor? We wonder what is going on and how long this will last? 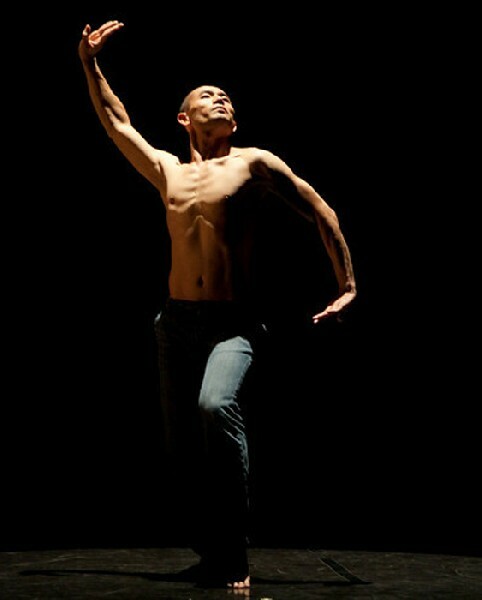 Eventually a single male dancer, Pichet Klunchun who founded the company in 2004, enters. He is wearing just a pair of loose fitting jeans. We absorb the image of his tautly chiseled upper body and monk like shaved head. As he moves there are variations of the traditional accents we have seen during the first part of the dance. But there is more energy. It seems that he pushes the limits while staying rooted to traditional style. Gradually he is joined by the company in increments from partnering to ensemble. They reveal variations of costumes. Some women have shorts and blouses as well as aspects of their initial costumes. Thodsakam reappears but at a faster pace with more stomping. Eventually he removes his mask. There is another projected image on the back screen this time of modern Thai skyscrapers. Toward the end of the piece the music is changed from Thai instrumentation to a grand piano and a lyrical composition. Eventually the dancers form a line, hold hands, and struggle against each other with lateral movements. It was a stunning and insightful glimpse into another culture and traditions of dance. More insightfully it signified the dilemma of remaining rooted in ancient paradigms that respect the culture. While also displaying, in such an articulate and enticing manner, the need to expand those paradigms into contemporary culture. To build upon, rather than to abandon the past. The work was both respectful as well as progressive. There was a powerful statement of the importance to sustain and respect traditional culture as well as to acknowledge the challenges of contemporary society. This is a company that deserves a wider audience and incentives to bring their work to a global audience. "We had the opportunity to see it at the Pillow on opening night. I give it five stars."